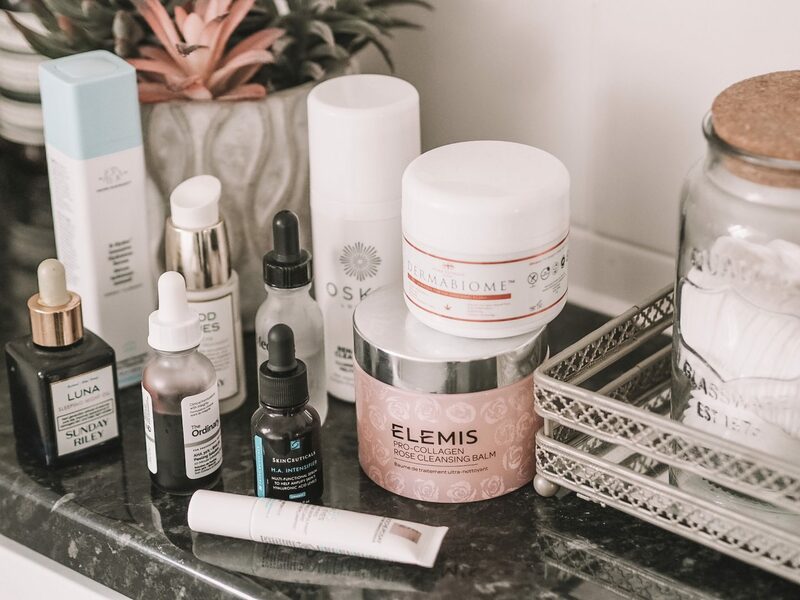 Previously I’ve tried to keep my skincare as simple as possible, but over the past year I’ve spent more time adding some more products into the mix and making sure I dedicate a little more time to it and it’s really paid off. 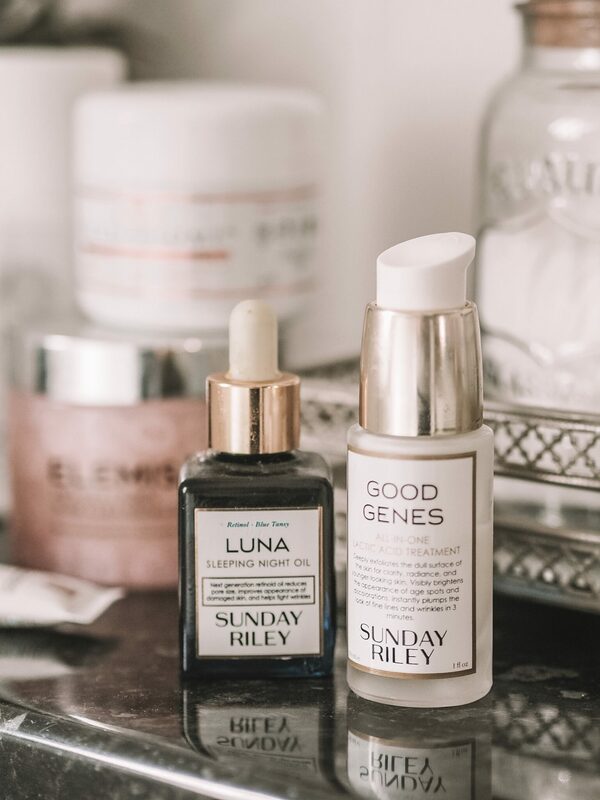 So looking back at the new additions to my routine there are some real heroes that I need to shout about as they really are game changing skincare products. First up two cleansers that I am equally as obsessed with. No favourites here – these are both as amazing as each other. The Elemis Rose Cleansing Balm – it was originally a limited edition last year for Breast Cancer Awareness month but now it’s permanent. This is a very good thing because I’m obsessed. It’s a thick balm but melts down into skin like a dream. Then add a little water and it goes into a milky consistency, rinsing away and taking all the makeup with it. Perfect. 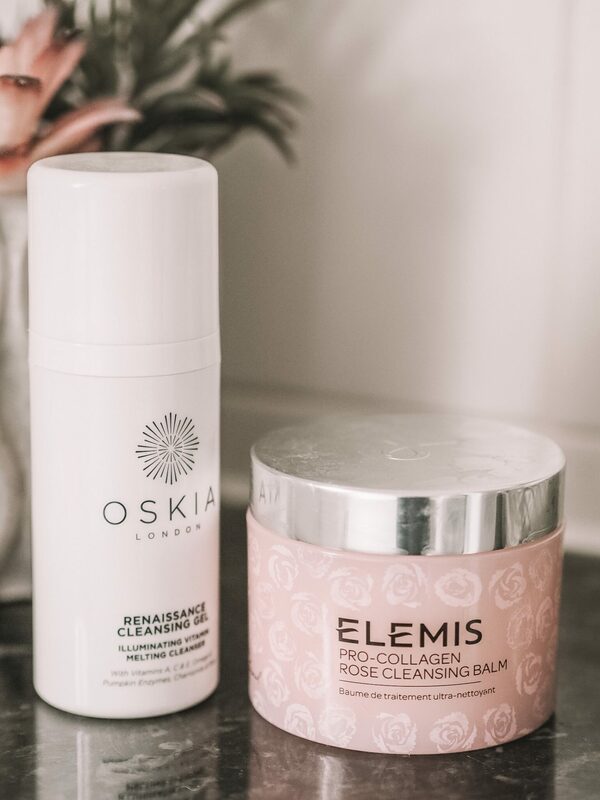 Also, the Oskia Renaissance Cleansing Gel. A similar type of texture, a thick ish ever so slightly sticky feeling balm that melts into skin (can you see a theme?!) 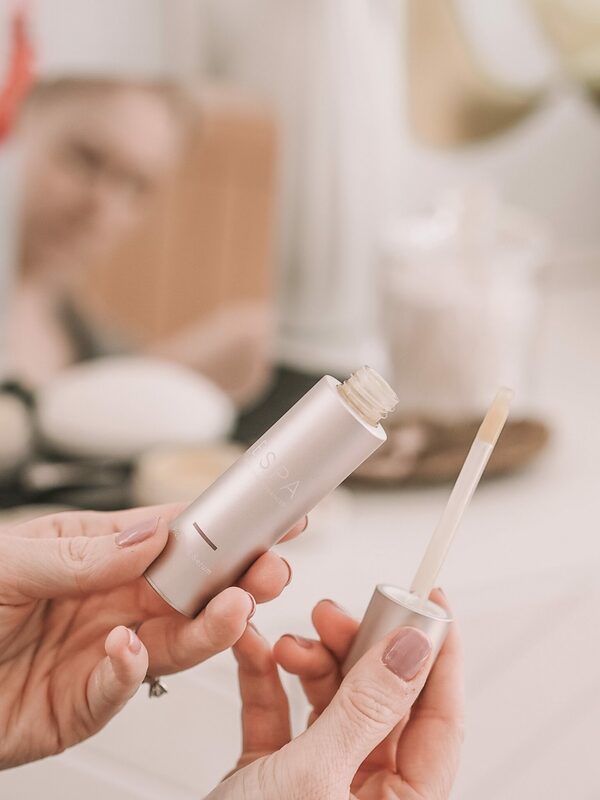 The formula contains Pumpkin Enzyme to help exfoliate the skin by breaking down the connections between the dead skin and the fresh new skin. I tend to use the Elemis as my makeup remover and the Oskia as my cleanser. Leaving on the skin for a little while to really get that pumpkin goodness exfoliation. Both are amazing for dry or dehydrated skin. 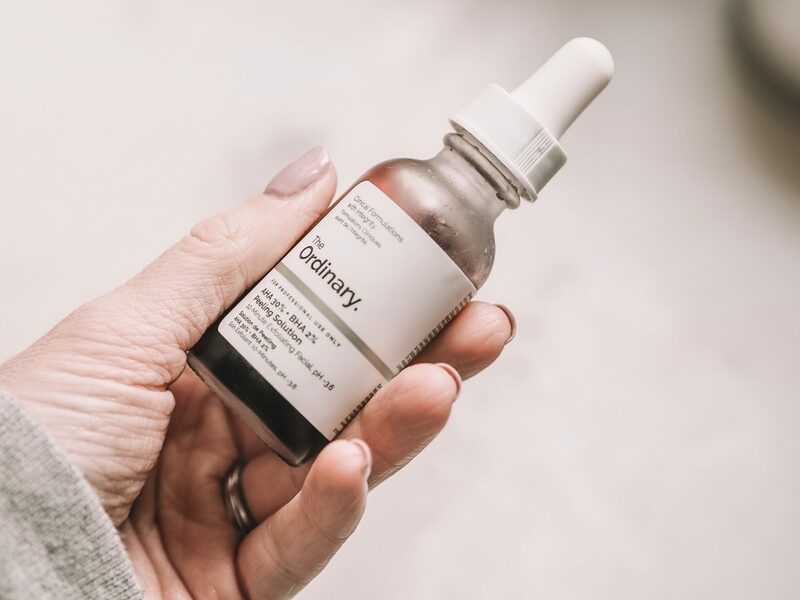 I do love a good serum, for some reason it’s stuck in my head ever since I was chatting to the lovely Ree about a certain 2000’s pop star she met a while ago. When Ree commented that ‘her face looked like it needed a good lot of serum…’ ever since I’ve been slathering on serum extra generously. I’ve always loved it as a skincare step but something about that comment really stuck and now I make sure nobody will say that about my face! 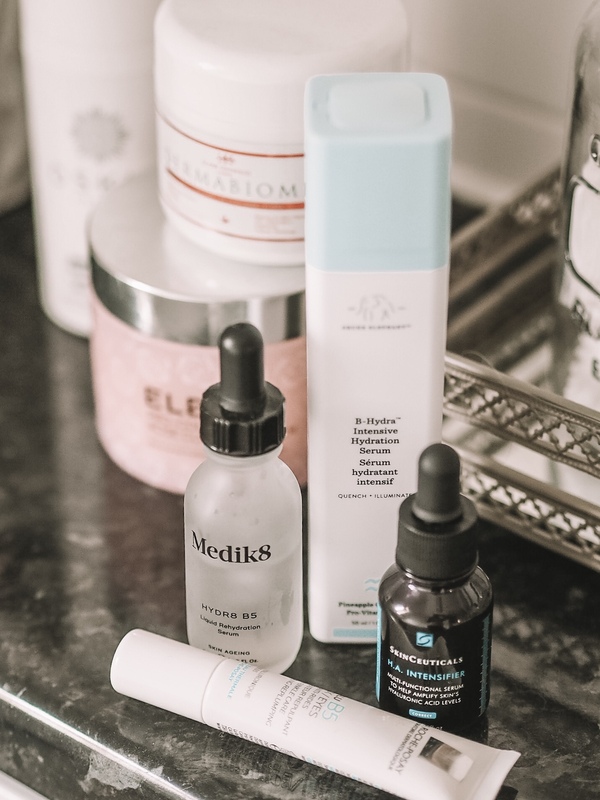 At the moment my two most used are the Drunk Elephant B-Hydra Intensive Hydration Serum, Medik8 Hydra B5 and the ESPA Tri-Active Advanced ProBiome Skincare Serum . Plus I’ve also been using the Skinceuticals HA Intensifier to really try and boost how my skin and the serums cooperate. Basically I can’t get enough of a serum and it’s definitely a game changing skincare step for me. 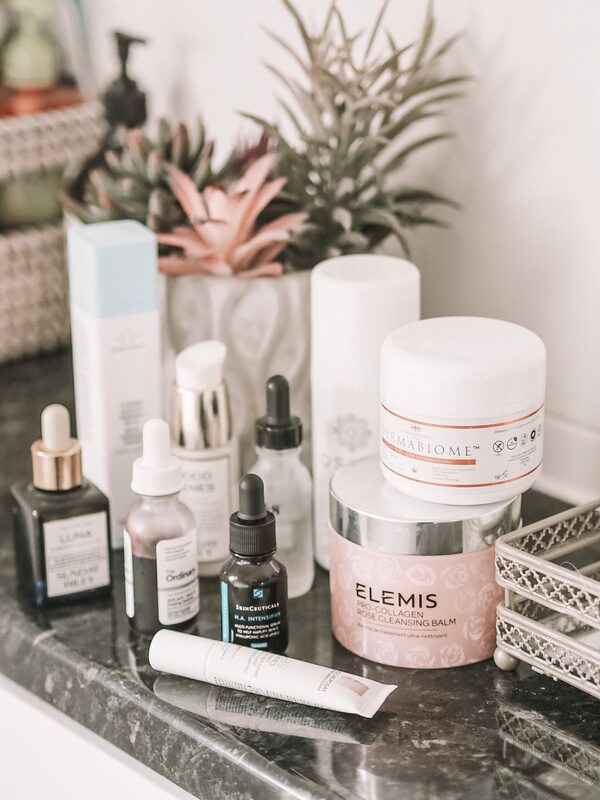 When it comes to masks, despite having a lot to choose from to tackle all sorts of skin ‘issues’ the one I keep going back to time and time again is by wonder-facialist Marie Reynolds (well, more than a wonder-facialist, she’s more of an all round wonder). But she has an incredible range based on her skin treatments she offers. The mask is now called ‘Restore‘ (I have the one under it’s original name Dermabiome). This mask or ‘skin food’ is a green powder that you blend with a little water to make a paste and apply to skin. 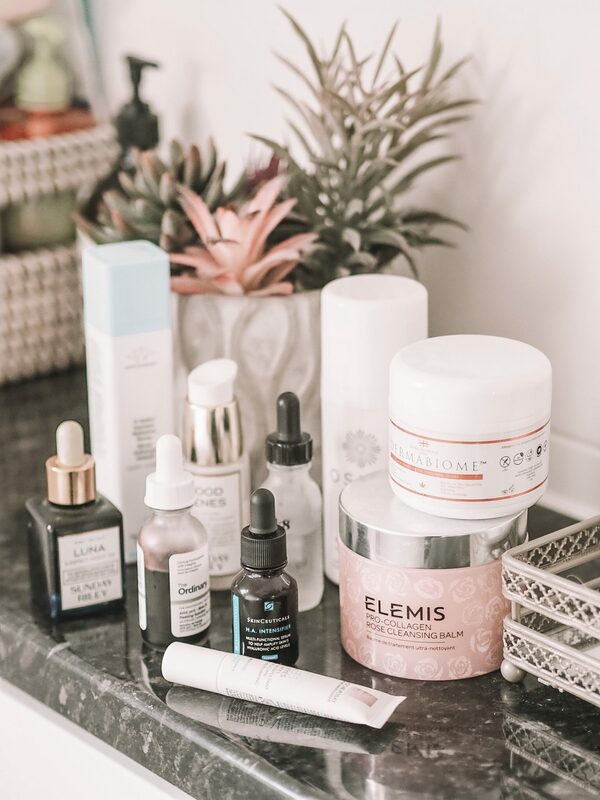 It’s one of the leaders of the skincare trend I mentioned in THIS post for skincare to look after/feed/balance the skin microbiome. I find using a flat foundation brush works well for this to avoid it being a total messy disaster… But the best thing about this mask is that I don’t think there’s a skin issue it doesn’t help in some way. It calms and soothes, it’s anti-bacterial, brightening… it really does a bit of everything and my skin always feels great after using. Sure, it’s a tad messy but that’s part of the fun. I have a new eye cream in my life and I’m really enjoying it. It’s by one of my favourite skincare brands, La Roche-Posay (one I use with Ella most days). The cream is the La Roche-Posay B5 Eye Cream and for some reason I was surprised by the texture. Expecting a more gel/serum type when actually it’s a light cream. It feels like it does a good job without being overly heavy. It feels more ‘dry’ than one of my other all time favourites of the Khiels Avocado Eye Cream but sort of similar in terms of immediate effect in hydrating. For my eye area my number one priority is just hydration and that’s exactly what this delivers. Then last but by no means least a special product by The Ordinary. This slightly-creepy looking when applied product is the Ordinary AHA 30% + BHA 2% Peeling Solution and it’s a tingly feeling, blood-looking wonder product. It really does tingle, so if you have sensitive skin then tread carefully. But for a super fast at home peel/chemical exfoliation I’ve not found anything better. I do it before bed, then slather on a cream of choice overnight and it always feels like it absorbs in by morning. Fast, quick and easy with good results. What’s not to like? !